05.07.2011. On 29 June, the children’s charity "Förderverein Kinderzuhause" in Burbach was delighted to receive a donation of 9,500 Euros raised by Rittal employees and the company's owner, Friedhelm Loh. Some of the money had been raised by the Rittal Cup football tournament. The Rittal Cup is more than just a fun sporting event for Rittal employees and their families. The proceeds from food and drink sales are traditionally donated to a local charity, and this year, the Rittal Cup raised 2,300 Euros. Owner Friedhelm Loh, whose company Rittal celebrates its 50th birthday this year, did more than just match this amount as usual. In honour of the anniversary, he also donated an additional 50 Euros for every player in each of the ten teams competing for the charity football cup, as well as for every helper. 2,300 Euros of this went to VfB Burbach, which loaned the use of its stadium for the Rittal Cup, while 9,500 Euros were donated to Förderverein Kinderzuhause Burbach e.V. Among other things, the charity supports two children’s facilities – Kinderzuhause and Burgweg – in Burbach, both of which are dedicated to helping children and young people with severe multiple disabilities. The former provides temporary care, while the latter is a permanent residential facility. Rittal’s donation comes at a very opportune moment, because for years the charity has been planning to extend the range of services it provides to children and young people. The plan is to build a new residential home in Burbach to accommodate twelve young adults. The charity has already purchased a plot of land. "Our young residents need follow-on care", Rüdiger Nies, the charity’s chairman, explained during the presentation ceremony. "When they are too old to live in the Burgweg home, they will be able to move into the new facility without major upheaval to their social environment." "It is our pleasure to support the charity’s invaluable work and this important project for a new facility for disabled adults, thanks to the Rittal Cup and the generous donation by Mr Loh", said Hubertus Spiekermann, Head of the Rittal plant in Burbach. "Rittal’s donation will take us an important step closer to making this new facility a reality", said Rüdiger Nies as he expressed his gratitude. "Without Rittal’s support, our activities for the disabled would not be possible. The new residential home is dependent on donations." 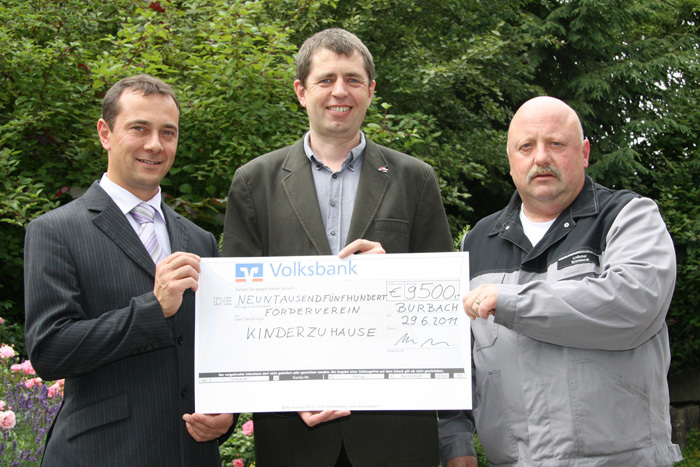 Hubertus Spiekermann (left) and Uwe Höchst (right) present the donation to Rüdiger Nies (centre).